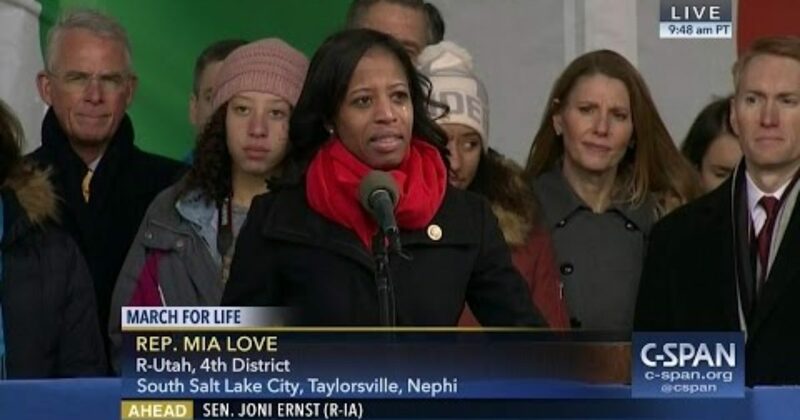 Speaking at the 44th annual March for Life in Washington on Friday, Rep. Mia Love (R-Utah) gave an inspirational speech that tears to many in the crowd, including herself. Love began her speech describing a young couple who immigrated to the United States from Haiti forty-one years ago. The couple discovered they were expecting and considered their options, one of them being abortion. Even though had to work multiple jobs to provide for themselves, they chose life for their unborn child. “Forty-one years ago that couple could have made the choice to abort, but they didn’t,” said Love. “They chose life. I’m certain that this couple would never have thought that that child would become the first female, black, Republican member elected to Congress,” an obvious reference to herself.